2017 Npower volunteers often asked the difference between the Onboarded and Enrolled icon reflecting on the 2017 Beneflciary profile page. 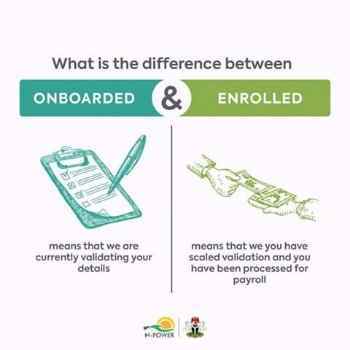 The difference are simple, you should note that if your status still reflects onboarded, then you are undergoing the validation process and if your status have changed to enrolled that means you have scaled validation and you are processed for N-power payroll. Npower also said that those whose letters have not been approved, you will still get your August stipend but ONLY after your details have gone through the process. And for the beneficiaries whose state have not submitted their deployment list they will still collect their August stipend if they submit later after théy have gone through the process. According to N-power, they do not assign officials at State levels. NPower offlcials at State levels are appointed by the State Government. N-Power works with whoever is appointed. I didn't get my stipends for the month of august and September,my status is showing onboarded. Enter your comment...npower good evening, I want to remind you please, u enrolled me, but still I'm not receive my stipend at all, I 'm in katsina my phone number is 08161601544.